The Lunkerhunt Prop Series brings forth a new chapter in topwater fishing. The Lunkerhunt Prop Series is a family of hollow bodied soft lures that feature an innovative prop system, a super soft streamlined weedless design, premium hooks, and high-quality patterns. 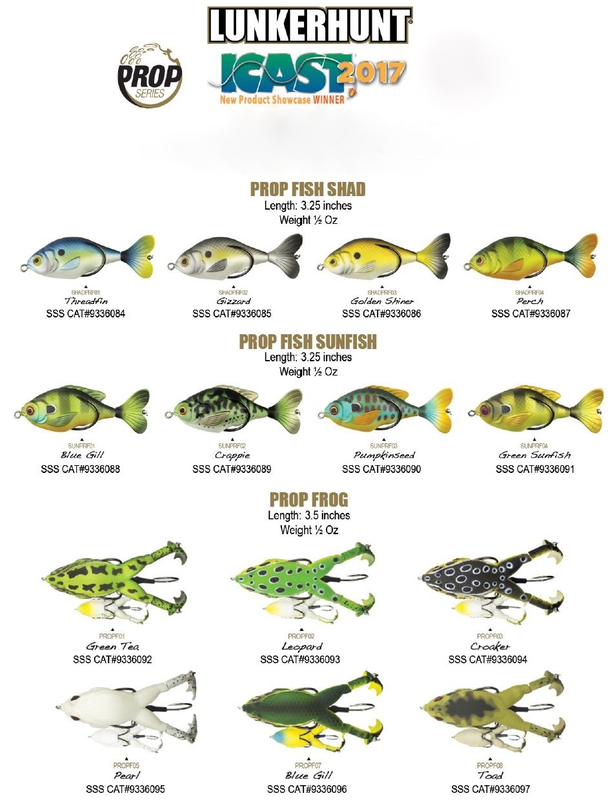 The Prop Series features three body styles: The Prop Frog, The Prop Fish Sunfish, and The Prop Fish Shad. While all three body styles share common characteristics, they also have their differences. All body styles churn water, gurgle, and splash during the retrieve. On the pause, they float on the surface. They have all been designed to replicate North America’s top gamefish forage. 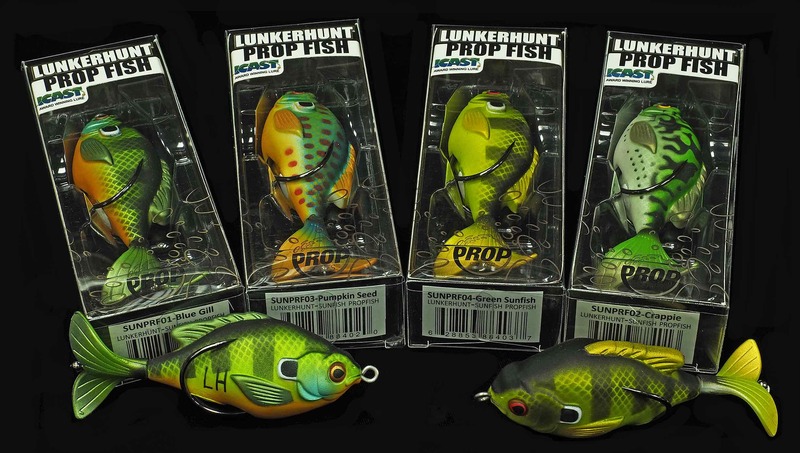 Contact Us for current inventory after visiting the Lunkerhunt Prop Series website here. The Lunkerhunt Prop Fish Sunfish and Prop Fish Shad have been designed after two of the most popular freshwater gamefish forage species. Like the Prop Frog, they also feature a soft plastic hollow body. What makes the Lunkerhunt Prop Fish unique is its single prop system. This single prop system has a subtler action than that of the double prop system of the Prop Frog. During the retrieve, the Prop Fish has a surface churning action that closely mimics bait fish breaking the surface, as well as cutting through and around cover. The Prop Fish excels when fish are pressured, spooked, and super shallow. It has a weedless hook system and streamlined body shape that enables it to effectively torpedo through and skip under cover, which enables it to get into the hard to reach places where no other prop baits have been before. When fish strike, high quality, super sharp, weedless hooks are there to greet them. The Lunkerhunt Prop Frog is an extremely efficient fish catcher. It has been designed to fish where other prop lures with exposed hooks cannot. Pads, wood, and slop are no match for the Lunkerhunt Prop Frog. Its unique design enables it to cruise over the top of cover, re-enter the water, and start churning up water without skipping a beat. Its double prop feet make a lot of noise and disturbance on the water surface, which make it an easy target to track down. Active and reactive fish cannot resist its call. When they hit, a full set of weedless hooks is ready to greet them. The hook system on the Lunkerhunt Prop Frog has been designed to deflect from cover, but hang on to fish. It has an integrated hook system that encases the body and sits perfectly between the prop feet. This results in optimum performance and high hook up ratios. 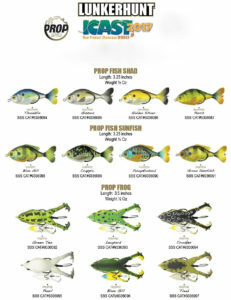 A Lunkerhunt Prop Fish Assortment.